The Arms Control Association, founded in 1971, is a national nonpartisan membership organization dedicated to promoting public understanding of and support for effective arms control policies. 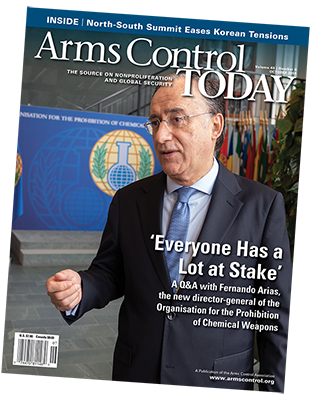 Through its public education and media programs and its magazine, Arms Control Today, we provide policy-makers, the press and the interested public with authoritative information, analysis and commentary on arms control proposals, negotiations and agreements, and related national security issues. In addition to the regular press briefings the Arms Control Association holds on major arms control developments, the staff provides commentary and analysis on a broad spectrum of issues for journalists and scholars both in the United States and abroad. Reporters: If you are interested in contacting one of our experts, please contact Tony Fleming, director for communications, at [email protected] or (202) 463-8270, ext. 110.